Earn up to 1,336 reward points. Kills the tone-sucking pedal noise in your sound. The Noise Terminator is a 9V-battery-powered pedal designed to preserve the original tonal characteristics of your signal while removing unwanted noise that occurs when multiple effects are used. It surpasses the performance of conventional noise gates by allowing the player to switch between 2 threshold settings: Soft - with less noisy equipment or Hard - when more radical settings are required. AC adapter jack for electrical power. Get rid of that harsh screeching and hissing. 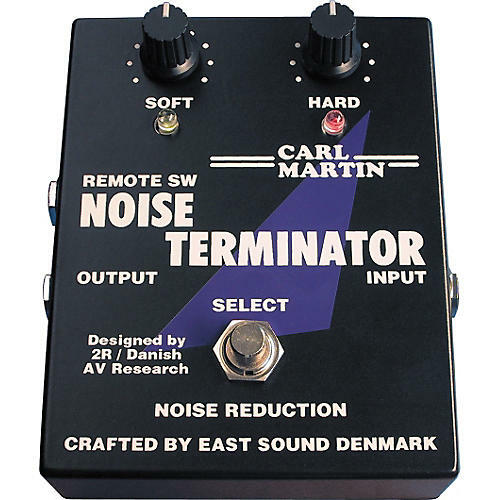 Order the Noise Terminator now!